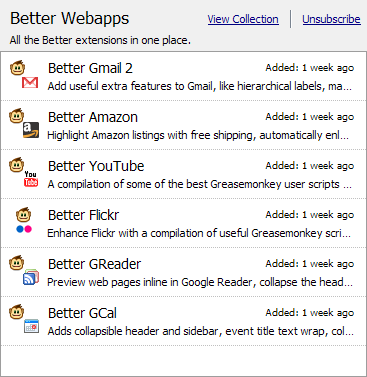 Now that Mozilla’s launched Add-on Collections, an easy way to subscribe to lists of good extensions for Firefox and friends, it only made sense to compile my series of Better extensions into a single collection. You’ll need Mozilla’s official Add-on Collector to subscribe to the collection and others; if you do, you’ll automatically get updates to it as we go along. If you have questions regarding any of the Better Webapps add-ons, hit up the mailing list. Also, speaking of Better add-ons and collections, thanks to both Lifehacker and Download Squad for including Better Gmail 2 in their collections: Lifehacker’s Must-Have Extensions and Downloadsquad Pack. I wanted to ask if you could possibly make these ‘better’ extensions compliant with mozilla lab’s Prism project? I don’t know how difficult a task this is? But it would rock my world if I could have a standalone google reader w/ your better google reader extensions.